The administrative division of the health district provides support for all programs. Its responsibilities include the development of budgets, monitoring expenditures, processing personnel transactions, maintaining computer systems, maintaining vital records, billing and collections. The combined budgets of all health departments in the Fifth Planning District are approximately $10.2 million. Of this amount, approximately $3.2 million is provided by state government, $2.4 million by local governments, $1.4 million by collection of fees and $3.2 million in various grants from the federal government, the state government and private foundations. These funds are used to provide staff and facilities, as well as equipment and supplies to provide services as mandated by federal and state regulations. The districts employ approximately 140 staff, about 120 full time and 20 part-time. The districts provide services from nine locations in the Fifth Planning District, seven of which are open Monday through Friday and two that operate part time. 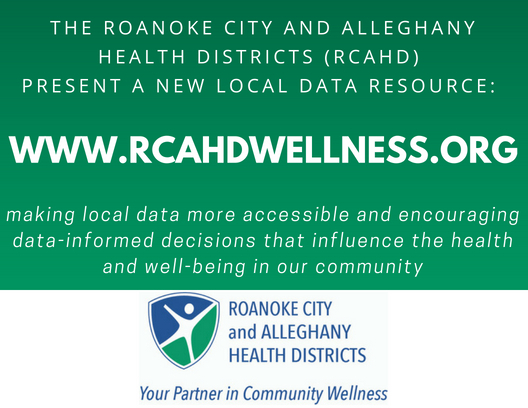 The Roanoke City and Alleghany Health Districts (RCAHD) announces www.RCAHDWellness.org! This is a web-based data resource center that provides local socioeconomic and health data, links to data resources, best practices, and other information to promote community health and well-being. The intent is to give the community the tools needed to understand the public health indicators that affect the quality of life for all who live, work, and play in Alleghany County, Botetourt County, Covington City, Craig County, Roanoke City, Roanoke County, and Salem City. RCAHDWellness.org provides a wealth of non-biased information in one, accessible, user-friendly location.